It is well-known that no-trump contracts are races. The defense is trying to set up its long suit, while declarer is battling to establish the winners that he needs to get home. Suit contracts tend not to be such clear-cut contests. But sometimes speed is important. In this example, West leads the diamond three against four spades. Who should win and how? 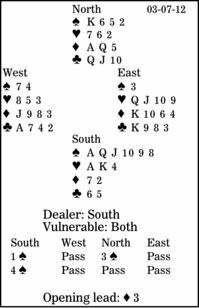 North has 12 high-card points and four-card spade support, which would often be sufficient for a game-forcing response. However, with 4-3-3-3 distribution and eight losers, North sensibly downgraded the value of his hand to a game-invitational limit raise. South, having more than a minimum opening, raised to game. Declarer starts by counting his losers: none in spades, one in hearts, one or two in diamonds and two in clubs. Next, he should check his winners: six in spades, two in hearts, one or two in diamonds and one in clubs. South needs one diamond and one club or two diamonds. There is a strong temptation to take the diamond finesse at trick one. Here, though, it loses, and if East shifts to the heart queen, declarer will go down. The defenders will take one heart, one diamond and two clubs before South can establish his 10th winner in clubs. Instead, declarer should win immediately with dummy's diamond ace, draw trumps using honors from his hand, and play on clubs. The defenders can take one diamond, but they lose the race. South sets up his club trick, on which he discards his heart four, before the defenders can cash a heart trick.